”Come, you who are blessed by my Father; take your inheritance, the kingdom prepared for you since the creation of the world. For I was hungry and you gave me something to eat, I was thirsty and you gave me something to drink, I was a stranger and you invited me in, I needed clothes and you clothed me, I was sick and you looked after me, I was in prison and you came to visit me.” “Then the righteous will answer him, ‘Lord, when did we see you hungry and feed you, or thirsty and give you something to drink? When did we see you a stranger and invite you in, or needing clothes and clothe you? When did we see you sick or in prison and go to visit you?’ “The King will reply, ‘Truly I tell you, whatever you did for one of the least of these brothers and sisters of mine, you did for me’” (Matthew 25:34-40). 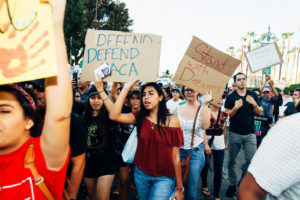 That stated, if people around us are dreamers, it seems Jesus calls us to show sincere care—compassionately listen to their concerns and pray for them. If need be, some have also offered “sanctuary” or other means of physical care for them. I think it would be good to provide a feasible path to citizenship. What is “feasible” is up for debate. “Show me the coin used for paying the tax.” They brought him a denarius, and he asked them, “Whose image is this? And whose inscription?” “Caesar’s,” they replied. Then he said to them, “So give back to Caesar what is Caesar’s, and to God what is God’s” (Matthew 22:19-21). This tells me that Jesus would understand the need for some immigration laws, and for order. But how tight to “tow the line?” We better pray on that. At the same time, that Jesus was gracious is shown throughout the New Testament, and most of all through his life and death. This Easter season, I encourage us to reflect on Jesus’ sacrifice on the cross, of himself, which he did so that other humans would not have to die for their sins. I’ve done enough writing, and scratching my head over this…. YOUR THOUGHTS on What you think Jesus Would Do (WWJD) in the way of immigration and dealing with Dreamers/DACA? ← WWJD with the issue of climate change? God said welcome all Foreigners, for we are all foreigners. I believe the immigrants here in America should reconsider their roots, they were given opportunity as should be given to others. Native Americans are foreigners in their own land. No acknowledgement of others when in the end God the creator has consequences for our inconsideration. I wish more people would ask “wwjd”, maybe we would experience the beginning of thoughtful endeavors in lieu of quick judgement. I think this is what we are supposed to do as Christians. If Jesus is the way, the truth, and the life, why wouldn’t we ask ourselves what he would do when we are faced with a dilemma? At a minimum, considering what Jesus would do should give us pause to consider the ramifications of our thoughts and actions. On the topic of immigration and DACA as it pertains to “wwjd”, I don’t believe there is any doubt at all about what our Savior would do. Matthew 22:19-21 spells it out in black and white. Jesus never said that picking up our crosses and following him would be easy. Does anyone remember this phrase, “Give me you your tired, your poor, your huddled masses yearning to breathe free”? Does this sound like something Jesus would say or does it only pertain to natural born citizens? Jim, I had to look up where that quote–“Give me you your tired, your poor, your huddled masses yearning to breathe free”–came from. On the Statue of Liberty. THANKS FOR THAT meaningful inclusion!